The Bigs is Ben Carpenter's first-hand account of his life's journey that started with a tumultuous, and at times frightening, childhood of frequent moves and the downward spiraling of his family's finances. From this precarious beginning, Ben tells how he progressed from being a naïve liberal arts graduate, to the owner of an out-of-control bar in Manhattan, to finally becoming the CEO of a major international investment company. The book originated as a list of instructions for the author's daughter as she was preparing to start her first job after college. Eventually, that list evolved into The Bigs, an invaluable guide for all college students, young professionals, and anyone seeking the hard-earned wisdom of a man who has won, and lost, many battles -- while winning the war of personal fulfillment. Over your 16 plus years of school, you have read countless books which did little to further your knowledge of how the real world works. 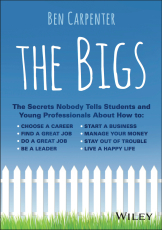 In this single highly entertaining book, The Bigs will bring you up to speed with a unique curriculum of stories and advice that will provide you all the tools you need to survive, thrive, and have fun in the big leagues of life.